Photograph of Little Howard Street, taken from Love Lane. This print was also entitled The Warehouse. 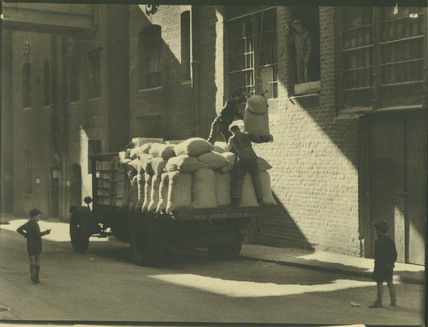 It shows two men on the back of a van, loading sacks onto it. The sacks have been passed to them from a man inside, he is visible at the opened window. There are two young boys watching the men at work.